People always said, “Oh yeah, once you are in college, you will miss having a home cooked meal every night.” And the true meaning of this statement never sank in until I was actually in college. I have eaten cafeteria food for a little less than a month, and I cannot wait to go home and eat my parents cooking. Not that our cafeteria food is bad, it just isn’t the food I’m used to. For all my UC school friends that still have another three weeks of summer, savor every bite of home cooked food. Appreciate it in its entirety. You will miss it. I was assigned to live in a room with three other girls. I was very unsure of how it was going to turn out because living in a cramped space with complete strangers for nine months could go many ways. Then, the week before I left to go to school, one of my roommates emailed us and informed us that she toured the room and we have a full kitchen and bath in our room. Um, excuse me? What? How is this possible? As it turns out, we were randomly assigned to the Resident Director’s apartment that was converted into a student dorm. We basically won the entire housing lottery. It has been such a blessing to have a kitchen and be able to make my own food once in a while. The truth is that I wish I could make every meal for myself and not even have a meal plan. But alas, since I’m living on campus, I must have a meal plan and I should use it or it would be a huge waste of money. Anyway, I have made eggs, chocolate chip banana pancakes, two batches of chocolate chip cookies, toast, and as of an hour ago, black bean vegan brownies. I even sent some cookies home to my mom and sister, because my sister made a comment over the phone that she and my mom were down to their last homemade cookie after sending me so many in a care package and how it was too hot to even think of turning on the oven to make more. So I sent them some dorm-made cookies because I wanted to repay the care package favor. 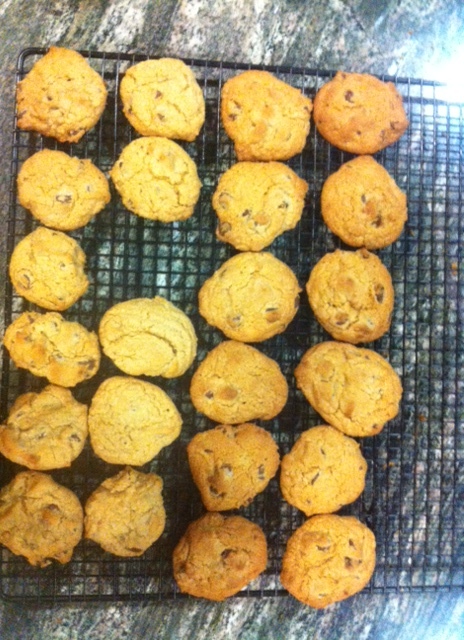 Because really, no one should be without homemade cookies for too long, especially after school has just started. That cookie in your lunch very well could be the highlight of your day some days. (Sadly, this is the case once or twice in life; you have bad days that require a cookie to make it better.) I learned to check with the person who ships your package as to how long it will take for it to arrive, because once they got back home, they were a little crumbly and drier than expected. It’s the thought that counts, right? Anyway, tonight I made plans with a friend(yes, I made a friend. Can you believe it?) to try out this new vegan recipe I found on Buzzfeed. We had no idea how it was going to turn out, but after being sick all weekend and therefore doing nothing but homework and sleeping, I had a little free time tonight to try it out. The verdict is that they are super fudgy, rich, and dense, and completely and unexpectedly good. 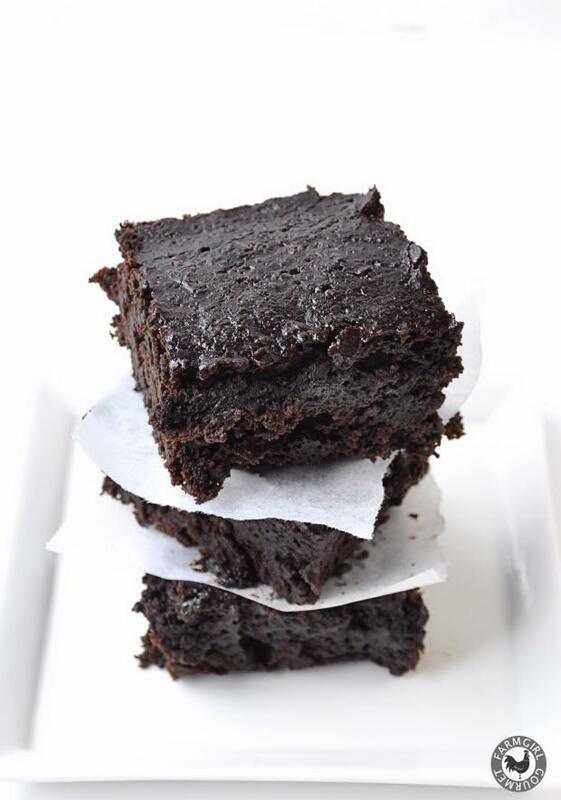 When I heard they had black beans in them I was a skeptic, but these are definitely brownies I would make again. Drain the can of black beans into a colander, rinse the can clean and the beans until all bean juice is gone. Pour the cleaned beans back in the can and fill the can back up to the top with fresh water. Puree the beans and water in the blender and set it aside. Combine all dry ingredients in a bowl: flour, sugar, cocoa powder, baking powder, salt, and instant coffee powder. Mix together. Make a well in the center to pour your liquids into. Pour bean purée, water, and vanilla into the bowl with the dry ingredients and mix together, being careful not to overmix. Stir in chocolate chips or nuts and pour into a greased 9 by 13 pan. Bake for 25-30 minutes and rotate the pan halfway through. Note: Depending on whether you like coffee or not, I would adjust the amount of instant coffee powder. The four teaspoons definitely makes it so you can taste the coffee-ness but not in a bad way. I don’t drink or enjoy coffee, but I loved the extra layer of flavor it gave the brownies and it complimented the chocolate very nicely(as expected). Also, I haven’t tried it with beer yet, but I am curious as to how it tastes, so when I get home I will be trying it again, this time with the beer. Lastly, I am not vegan, so I didn’t worry about using butter to grease the pan, so if you are vegan use canola oil or cooking spray. Click here to see the original recipe! There has always been a garden in our backyard. My mom was raised in the same house we live in now, so even decades before I was born, when the house was brand new, there has been a garden. My grandpa grew potatoes, corn, tomatoes, avocados, oranges, apricots, and beans. Today we grow apricots, spinach, romaine lettuce, swiss chard, garlic, beets, onions, kale, broccoli, snap peas, green beans, tomatoes, olallaberries, lemons, oranges, tangerines, basil, cilantro, potatoes, carrots, and avocados. Needless to say, we grow a lot of our own produce in the right seasons. Right now, the lettuce, chard, kale, and broccoli are booming. The weeds in the garden used to annoy me so much; there were so many of them and I HATED pulling weeds. I didn’t like it because I wanted perfection and didn’t want to see a single weed in the entire garden. The task was daunting, so I usually pulled weeds in maybe a two foot square area and gave up. Then one day something clicked. I realized that I don’t need to pull out all the weeds at one time. Like everything that needs fixing and adjustment, it becomes more manageable if you do it a little at a time. Now, every time I go out to pick fruits and veggies, I pull fifteen weeds or so, and toss them in the compost bin. Maintenance is always easier than overhaul. Anywho, because our veggies are booming, we have been eating salad right out of our garden and it has been wonderful. 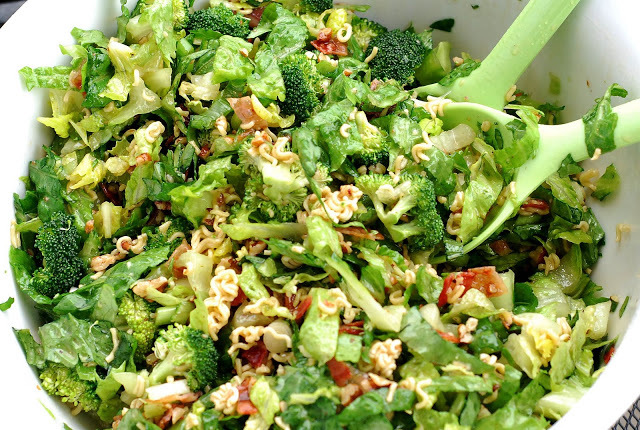 We got a recipe for an awesome salad that we fell head over heels for probably four years ago. Since then, I can count on one hand the number of times we haven’t eaten some variation of this salad with dinner. And we have salad with dinner almost every day, for sure an average of 6 out of 7 days of the week. The dressing is homemade and simply amazing, and we have altered the recipe to our liking and to make it easier to prepare every night. This isn’t a picture of one of our salads, but its very similar and you get the idea. It’s a delicious salad. My mom was hesitant to even give me the secret recipe to post, because it is so wonderful. Caroline on Sweetly Lemon specifically asked for it, so here it is! Put it all in a bowl together and wha-lah! We only have bacon in it for special occasions, and never measure any of it specifically, the measurements are just guidelines; feel free to alter them based off of how many people you are serving. Don’t put the pita chips on until the last-minute, as they will get soggy quickly and just roughly crush them in your hands and sprinkle it on top. We always have the dressing on hand in a protein shake type container because we use it so often. I would recommend making it in advance-it tastes way better that way. This salad has been particularly amazing as all the produce is home-grown, straight out of the garden. I highly recommend this salad, as well as planting a garden, but the garden requires much more time and space than the salad. Happy salad making! Ever since day one, my family and I have had almost weekly dinner with our family friends(more like family) that live four houses down the street from us. The meals are sometimes more elaborate, and sometimes its a “whatever we can make with what’s in both fridges” dinner. Either way, the food is always great and I always look forward to it. I can’t even count the times where we have called our family friends or vice versa and said, “Hey! We’re trying a new recipe tonight, would you like to join us for dinner?” (I’m pretty sure normal people don’t invite people over for dinner when they are cooking a new recipe, just saying.) The fun thing is that whenever we try a new recipe; there is always the possibility that we will have to call for pizza, and we are all willing to take that risk. In all my years of eating these creations, I can’t remember a night where the dinner has been so terrible that we actually have called for pizza. That being said, this environment has always encouraged me to try new recipes, and wing it, even if you don’t have all the ingredients and are under a little pressure. Over the weekend, my grandpa came down to visit and attend my sister’s soccer game. We all completely forgot that he had recently(within the past two weeks) become officially gluten intolerant, and didn’t remember until he said, “This is amazing! It’s the first bread I have had in two weeks!” when we made him a sandwich. He ate the sandwich, thinking it would be okay just for that meal, but it didn’t go over so well. He told us what he had been eating and how much he was missing noodles and toast, and especially cookies. He LOVES homemade cookies. He wasn’t even aware that they made gluten-free substitutes for bread and noodles, and was blown away that I could make him some gluten-free cookies. I, being the extremely resourceful person I am, googled some recipes, found a promising one, went to Sprout’s for the gluten-free ingredients, and embarked on a gluten-free cookie journey. The reviews I read for this recipe were all very good, and praised it. My goodness, I followed the recipe to a T and I ended up with gloppy, crinkly, soft, and gooey cookies that wouldn’t even come off the cookie sheet. It was a mess. 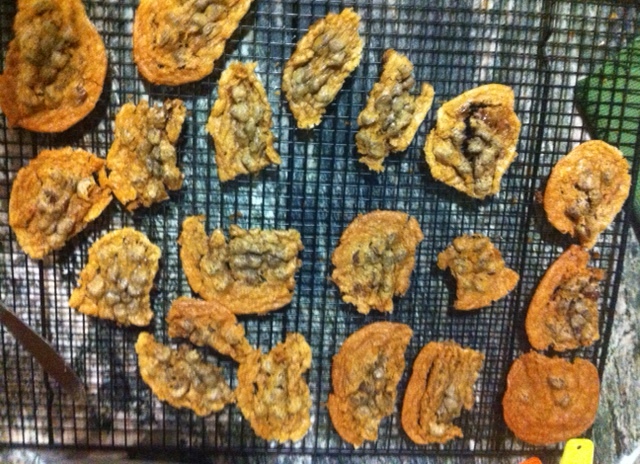 These are just the ones that came off the sheet looking at least a little like a cookie. The rest was only fit for ice cream toppings and/or immediate sampling. Needless to say, there were several cookie fatalities that night. I have never, ever, burnt ANYTHING this badly. EVER. It was terrible. I burnt everything so much that the chocolate chips were crummy. Boy was I frustrated. I don’t really like failing at things I normally excel at. Like I have said in earlier posts, I don’t mind failure, knowing that failure is the only way to learn, but seriously, I have been making cookies since I was old enough to be in the kitchen with my mom. Thinking back on it, I think I was more frustrated that my cookie pride was hurt, not really that I had “failed”. 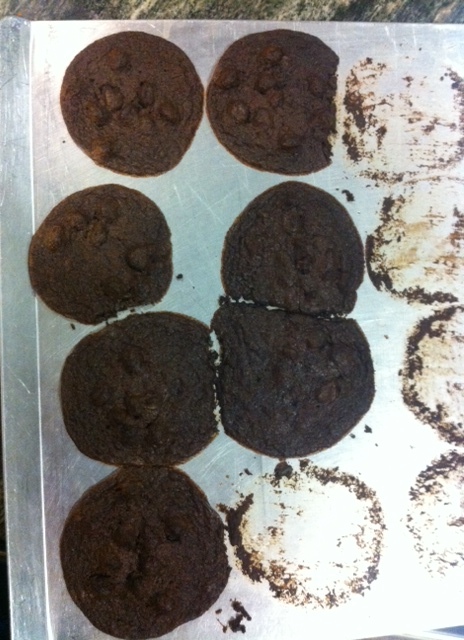 It wasn’t a complete failure as the undercooked ones tasted good, but just didn’t hold their shape. Being my hardworking and stubborn self, I wasn’t going to let these cookies have the best of me, I put the newly altered recipe batch in the oven and watched them like a hawk. The reward was SWEET REDEMPTION, both literally and figuratively. Lesson learned, just like Aunt BethAnn has always said, don’t ever be afraid to make a dish, based on how it will turn out or how it did turn out; you can always order pizza and try again another time. Professional chefs have had their share of meal mishaps and burnt food, and look where they are now. Maybe burnt food and mishaps are just a step in the right direction towards culinary perfection. Anyway, I almost forgot to include the recipe(the one I changed). Combine dry ingredients in a medium bowl and whisk to combine. In a large mixing bowl, combine egg and sugar and beat with an electric mixer on high until light and fluffy. Add butter and beat on high until combined. Add extract and beat briefly. Add dry ingredients and mix until combined. Stir in chocolate chips and nuts (optional). For 1 dozen large cookies use a 2 tablespoon (1/8 cup) ice cream scoop or drop heaping tablespoons of dough on prepared baking sheets. For 2 dozen small cookies use a 1 tablespoon ice cream scoop or a rounded tablespoon. Bake in preheated oven for 9-11 minutes or until cookies are crisp on edges and slightly soft in the middle. Cool on baking sheet. I was filling out an interest survey today for a class, and one of the questions was, “Where is your favorite place and why?”. Interestingly enough, one of my favorite places in the world is at our family’s dining room table. Not just because my parents make amazing food, but because its my one hour in every day where I can relax and be with my family. Sometimes our schedules are so jam-packed that the only topic that gets covered is the “family’s” schedule. Other times I end up laughing so hard that I cry, because we are just that funny. And then there are times where we just catch up with one another or have another family over for dinner, and those are both great too. I just love that precious hour (longer on the weekends), stenciled into my schedule every day, that I spend with them just sitting at the table. I remember the moment in elementary school that I found out that other kids my age didn’t eat dinner with their families every night. I was mind blown, completely and absolutely astounded. It seemed so normal and comforting to me; this new revelation about them made them seem almost alien to elementary school me. I felt bad for them and wanted to invite them over for dinner, so that they could eat dinner like I did and see how wonderful it was. I still feel bad for those people who don’t eat dinner with their families on a regular basis; they don’t know what they are missing. I encourage you to start small this week by trying to eat dinner with your family for just one night, if you don’t normally do so. The memories and positives that come out of it will far outweigh any negatives. Go ahead, you could even try it with the new recipe I am posting below. I would suggest that you could cook it together too, but I don’t want to get too crazy. With my enjoyment of the dinner table and all it brings, it only seems natural for me to like cooking and baking new things for us to eat. And I do. Cooking and baking are therapeutic for me. So, consequently, I like to try new recipes and experiment with old recipes. This recipe was an adventure for me. It was vegan, soy free, and sugar-free. And it required nutritional yeast. I had no idea what in the world nutritional yeast even was. As far as I was concerned there was only one kind of yeast-the kind you put in breads to make them rise. Boy, was I wrong. Anyway, I actually found this recipe on Buzzfeed (which lead me to Oh She Glows-link at bottom) , but it appealed to me because it was dairy free. When I started my freshman year, my immune system fell apart. I was sick almost every month with colds that wouldn’t completely go away for around two weeks. It wasn’t until last year that my dad and I discovered that running cross-country put so much stress on my body that it couldn’t defend itself against the common cold AND eating dairy made me more susceptible to colds and intensified them. After that discovery, I limited my running, giving my body time to fully recover from the colds, and I began to transition off of dairy products. The result was I got sick less often and felt way better because I wasn’t congested all the time! Now, after reducing my dairy intake to little to none, when I cheat and eat it, I get a nice stomach-ache. A long story to say, I am trying to find healthy dairy free foods so that I can avoid the stomach-ache. My first attempt at photographing my food! Please excuse the lighting, our kitchen suffers from bad lighting. Wow, I have taken so long to just get to the review of the recipe. Overall, this was really good. I over sautéed the garlic once, Facetimed my dad to double-check that it was burnt, and started over. TIP: Only sauté the garlic until just golden brown, on medium low heat. DON’T TAKE YOUR EYES OFF OF IT! The nutritional yeast is surprisingly good and has a nice flavor-make sure to get the powder/flake form and not the pill form(seems like common sense but they sell both). I added an extra garlic clove, and used the larger amount of pepper and garlic powder- the result was a pretty spicy sauce. Next time, I am going to tone down the garlic, both clove and powder, and pepper. I can always add more after the sauce is blended if it needs it. 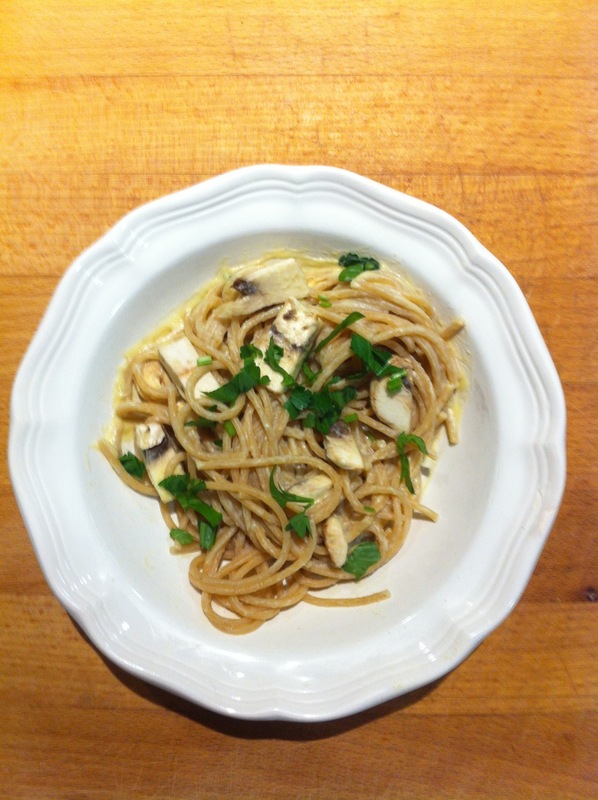 I threw in some mushrooms on top to garnish with the parsley. NOTE: I wasn’t a big fan of the parsley garnish at all- it looked pretty though! I suggest saute-ing the mushrooms and then putting them on top at the end. One could also add bacon to this if they were looking for extra flavor, but it certainly doesn’t need it. Add cauliflower florets in a large pot and cover with water. Bring to a low boil. Once boiling, cook for another 3-7 minutes until fork tender. Drain. Meanwhile, add the oil into a skillet and sauté the minced garlic over low heat for 4-5 minutes until softened and fragrant, but not browned. In a high-speed blender, add the cooked and drained cauliflower, sautéed garlic, milk, nutritional yeast, lemon juice, onion powder, garlic powder, salt, and pepper. Blend until a super smooth sauce forms. If using a Vitamix use the tamper stick as needed. The key here is to get a really smooth sauce so don’t be afraid to let it run for a minute or so. Set aside. Bring a large pot of water to a boil. Add your desired amount of pasta and boil for the time instructed on the package. Drain pasta. Add cauliflower sauce into the pot (you can use the same pot!) and add the drained pasta. Heat over low-medium until heated enough to your liking. Salt again to taste (the pasta dilutes the flavour). Serve with fresh minced parsley and black pepper. Feel free to add in your favourite sautéed or roasted vegetables. I think peas, spinach, or broccoli would work very nicely! 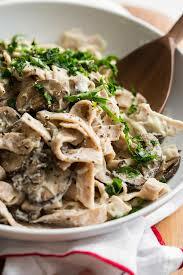 I added mushrooms, but I wasn’t overly crazy about them in this dish.